When applying Dense Wavelength Division Multiplexed (DWDM) networks to aerospace subsystems there is a need for selective flexibility in the amount of bandwidth that can be allocated during specific phases of a particular platform’s mission. There’s also a need to quickly reconfigure the interconnect structure to accommodate a variety of different types of missions and mission payloads. While this optical functionality is commonplace in today’s telecommunications infrastructure, airborne/spaceborne applications require orders of magnitude reduction in size, weight, and power. The High Technology Foundation team members are working with Ultra Communications, Inc to design and develop ultra-compact, multi-channel DWDM optical communications modules for use in aerospace fiber optic local area networks. 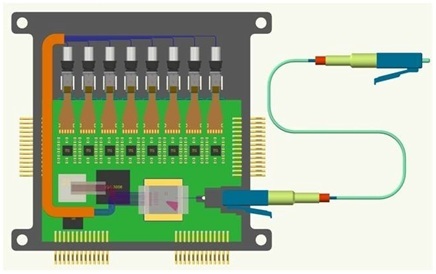 The availability of single packaged multi-channel optical modules would enable severely space constrained sensor applications to transmit large amounts of information efficiently via a single DWDM network connection. The ability to put this raw sensor information onto a DWDM network would allow critical processing to be performed remotely without the need for data reduction. This would also relieve the burden of co-locating the processors with the sensors.